It’s that time of year again, the leaves have fallen and the days are noticeably shorter. As Fall shows it’s influence on the landscape and the animals which reside there whitetail hunters across the country turn to the hottest topic of the year, THE RUT. Although we all know the rut offers one of the very best opportunities to harvest a mature whitetail buck, it’s still not a guarantee for success. 1) Hunt Where The Does Are – This is where pre-season scouting is very important, focus on the areas where you know does bed on your property and get in as close as possible to wait for bucks that are cruising and scent checking these doe bedding areas. The secret here is to hunt mornings and get in the stand before the does arrive from their nightly feeding routine and then wait patiently as often times a mature buck won’t make his rounds until mid-morning when he knows the does will be bedded down. 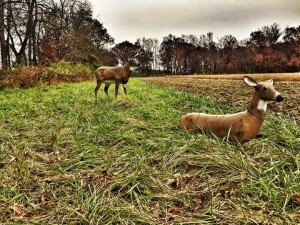 This tactic is best used during the pre-rut but can be very effective throughout all phases of the Rut. If you know an area is a “rut hot spot” from year to year don’t hunt it too early in the year and risk over-pressuring it. 2) Focus On Known Travel Routes – Understanding the layout of your hunting property will offer some great stand locations for hunting the rut. Typically these are very noticeable and obvious terrain features that focus and funnel deer movement to a small area. Rivers, large fields, large ridges or hillsides and even cattle pastures can influence where a buck will travel as he is cruising from one point to another looking for that “hot” doe. The best time to hunt these travel routes is midday when the bucks are covering a lot of ground in search of a “hot” doe. This is most successful during the pre-rut before actual breeding begins. 3) Hunt Like You Would For A Doe – This is probably the easiest tactic, but can also yield some of the best results. For your evening hunt find the nearest food source and be ready with a grunt or maybe a doe estrus call. Bucks will come to where they know does should be. Food plots, crop fields or possibly even acorns will still be holding the does as they fatten up for the stress of winter. Decoys can be very effective right now as the bucks will be very aggressive while looking for that first doe to come into estrous. 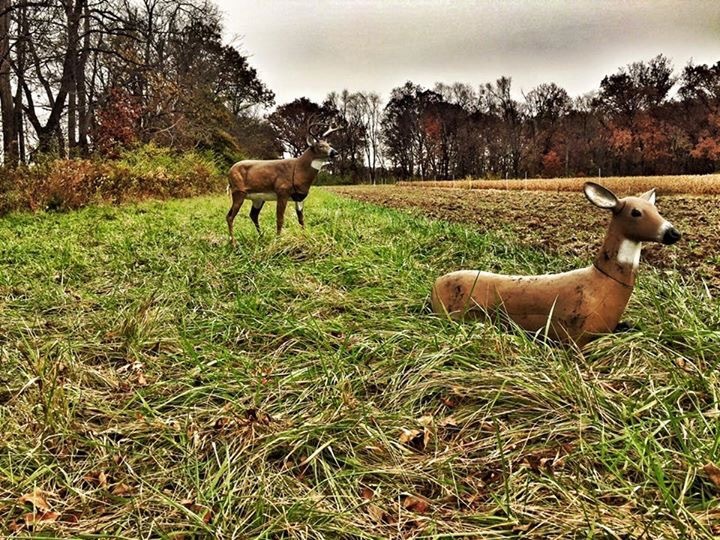 However, the use of decoys and grunts can be very tricky, over-use can immediately give away your position to a weary buck or the use of calls can peak their interest and bring them in on a string. 4) Stay Patient – Although hunting the rut offers some of the best opportunities of harvesting a trophy whitetail, it is also the least predictable time of the year. If you’ve followed the steps above and know you’re in a good “Rut Location” commit to that area and stay patient. Getting into your stand before daylight and logging some long hours in the tree is the best recipe for success during this exciting time of year. There is no substitute for time spent in the stand right now, sit tight and keep your bow close at hand…when your chance presents itself, it’ll happen fast!